If mothers and full-term babies do not get good help with the initiation of breastfeeding in most hospitals, and they don’t, mothers and premature babies get even less help and more undermining of breastfeeding. Part 1: premature babies need to be in incubators? This is simply not true in most cases. Premature babies (and full-term babies) in Kangaroo Mother Care (skin to skin contact for much of the day) are happier and stabilize sooner after birth. And they are more stable even after the first hours after birth. They are generally more stable from the point of view of heart rate, respiratory rate, blood pressure, blood sugar than babies in incubators. Premature babies in KMC (Kangaroo Mother Care) are less likely to stop breathing for prolonged periods of time (more than 20 seconds is considered prolonged) or develop bradycardias (slow heart rate) when in skin to skin contact with the parents. They maintain their skin temperature better as well. Furthermore, studies show that skin-to-skin care of mothers with their babies during venipuncture (blood letting) had a pain-relieving effect. And, very importantly, they are more likely to begin breastfeeding earlier to leave hospital breastfeeding and exclusively and when the mother and baby have been in Kangaroo Mother Care. Although this information has been readily available and published in peer-reviewed medical journals since the early 1980s at least, it seems that in most NICUs around the world, Kangaroo Mother Care is simply not done. Premature baby, born at 28 weeks gestation, now 1 week old in skin to skin contact with his mother. Kangaroo Mother Care helps the baby maintain his body heat, heart rate, respiratory rate, blood sugar level, blood pressure and encourages early initiation of breastfeeding. 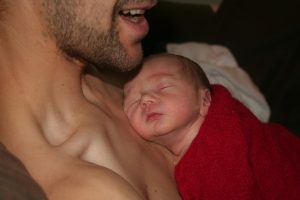 Fathers can also do skin to skin care with their baby. Kangaroo father care? Here are just a few of the many articles showing the positive results of Kangaroo Mother Care for premature babies. More studies, but a complete list could go to hundreds of studies that are available in the scientific literature. Föhe K, Kropf S, Avenarius S. Skin-to-Skin Contact Improves Gas Exchange in Premature Infants. Journal of Perinatology 2000;5:311315. Need breastfeeding help in Toronto and area? Book an appointment with the International Breastfeeding Centre.